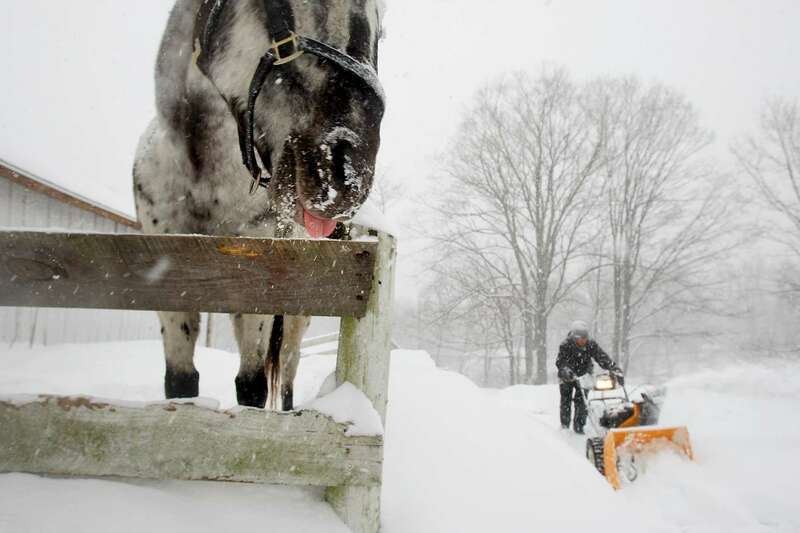 Boxboro, MA 12/21/08 - Selah Smart, cq, 16, of Boxboro, MA, struggles to plow a path to the barn that houses his two horses, Wallapooluza, (left, tongue out) an Appaloosa, and Sara Sioux, a Shetland Pony. "Sara doesn't like the cold," said Smart, as he cracked the ice from her water bucket. "But Wally loves it," he added. Areas west and north of 495, such as Boxboro, are being hit especially hard by the second severe winter storm in two days to hit the Boston metro area. Dina Rudick/Globe Staff.